Laser technology for color label printing continues to fall out of favor when not printing full page width 8-1/2 inch labels. Printing less than the width of the entire page increases maintenance costs and causes toner fusers to fail. Laser printers are not as suited for harsh environments. The heat involved is typically too much for standard polypropylene films to handle, but recently some inroads have been made to reduce the amount of heat in order to accommodate more viably priced films. Folks who require some flexibility over the materials they run, for their customers’ requirements for example, enjoy the opportunity to print on inexpensive polypropylene films. Laser tends to be better suited for wide-width page printing on papers, polyesters, some expensive vinyl films. I’m still a fan of laser printing for its durability (ink toner gets fused onto the label material), ability to print on non-topcoated materials, print speed, and the material pricing. On average, laser paper labels are about 20% less than ink jet paper labels. Even so, most research and development in this area is being spent on ink jet technology. Epson has invested heavily in this area. 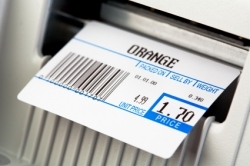 There is no doubt printing labels in color cost more than monochrome printing, typically double or triple the cost. Ink jet requires quick-dry topcoatings on the materials, or a special pigmented ink that adheres to almost any material. It is difficult sourcing ink jet label material for less than $1.00/MSI, compared with .50/MSI for the very best thermal papers. Since there is this additional cost when printing in color, companies who are mandated to print in-house labels that are durable, and water resistant, such as for GHS certified labeling, and even companies who aren’t mandated to produce durable labels, still prefer to do so. They expect their rather pricey product labels to hold up, and that the print is still legible after their product is in use. Most however are not interested in investing into a label finishing system which cuts, laminates labels, and winds onto finished rolls for transport over to labeling equipment. Ink-jet continues to replace laser, as well as some traditional forms of printing including flexographic and offset. The recent advancements of the 3D printing industry utilize ink-jet, or what I like to refer to as “nozzle-technology.” The only difference is that the nozzles are dispensing plastic polymers, which form layers and shapes, rather than dispensing inks. I’ve even seen how this nozzle technology, coupled with robotics, is already in use for construction projects. Large nozzles can dispense concrete and cement, copper wiring for the electrical systems, and probably more than we can imagine at this time. Considering the advancements made with ink-jet nozzle technology, it is easy to see that the printing industry is also going is this direction. There are more color printer options available at this time than ever before. In fact, I am aware of no less than 18 smaller companies who act as major distributors or VARS for color label printers. The problem for most of them is that they don’t really control their own destiny due to the fact that they don’t own the technology. There are still only the major players who actually manufacture print engines: Epson, Cannon, Memjet, and HP for ink jet, and Okidata and Lexmark for laser engines. From that list, only Epson leverages their entire channel, and owns their technology. They have the resources to be a long-term player in this market. Epson is an established global company with the strongest vertical integration in the industry. Epson Colorworks and Surepress printers have the most viable options for ink jet printing at this time, along with the most future proof investment, due to their heavy investment into this area. And there is no “blame the other guy” because there is no other guy. Epson stays closer to the end user and market this way. Epson utilizes their MicroPiezo, PrecisionCore nozzle technology which presses out variable size droplets, as opposed to squirting out fixed size droplets. The end result is more detailed printing. Epson is also the only brand that builds permanent print heads into their printers. The additional hidden maintenance cost of having to frequently replace printheads can quickly become an ugly reality with other brands. In prior posts, I used to include a chart that would outline most of the color label printer choices and options in any given quarter. However, since models seem to be discontinued nearly as fast as they are released, and rather than point out flaws in other brands that typically end up being smoothed over with new model releases, my focus at this time is solely on the Epson Colorworks Printers. Epson’s inks are pigmented rather than dye based, and offer the most durability. Labels do not need to be laminated, and the Epson Colorworks line, when coupled with the proper printer material, easily print labels that meet GHS certification. For outfits in a faced pace environment such as healthcare, and for those who require SOME color on their labels, Epson’s C3500&nbsp;is the solid choice. This printer is a good fit with industrial applications requiring some color coding, or perhaps hazardous chemical markings, required in color. It is not a good a fit for background colors, high resolution labels, or large labels. The price point is decent at $1850 and the ink cartridges are separate. &nbsp;One feature I like in the driver settings is the ability to change the print resolution, which saves on ink for lower resolution label jobs. The downside happens to be the small capacity print cartridges, which were standard faire a few years go. The typical trade -off with the smaller capacity cartridges is user-friendliness vs. the cost of ink. I also like to mention having to continually replace ink cartridges in the middle of print jobs, when perhaps a more robust model would have made better sense for the long haul. Epson has thousands of these printers in operation. For large drum labels up to 8” wide, with GHS certification the C831, even though it was released a while ago, may still be the only viable alternative for some. It has a tractor feed mechanism that allows wide labels to be pulled through the printer more easily, and this model is suited for harsh environments, where laser page printers would have a tougher time. The downside is that the labels should not be printed too close to their border, since registration is not perfect due to the tractor feed mechanism. While print cartridges are small capacity, most labels printed with the C831 only require some color symbols on the labels—not a lot of color. While there are some competing brands for this wide label width most can’t handle the durable, pigmented inks. Price point is under $2,000. For less harsh environments, inexpensive, sheet fed laser printers may still be an option for full width page printing. Epson’s latest release is the C7500/C7500G. 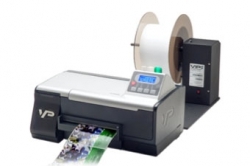 It’s a real industrial grade color label printer that utilizes durable pigmented inks. No label laminating is necessary! The difference is that the G model prints on gloss media, whereas the non-G unit will meet GHS certification on certified matte materials. I like the high capacity separate ink cartridges, which translates to less cartridge changing. And the ink cost is more competitive. Imagine the time difference, while running jobs, between utilizing these 250ml cartridges, vs a competition’s 28ml cartridges. The C7500 models are fast, dependable, high-resolution labels printers that when coupled with external rotary cutters, can run continuous, non-die cut rolls of material. This way, for print jobs requiring different sizes, labels can be cut to their desired length without having to load any other size material. The printer's on board cutter negates having to tear off labels at the end of print jobs, and is used in favor of non-perforated labels for high-speed labeling applications. The cutter button on the front panel makes this convenient. These $8500 printers can print up to a maximum 4” width, which I feel is a limitation. I’ve spoken with plenty of prospects who require wider units for their labels. Hopefully, Epson will be releasing a 6” or 8” high resolution model in the near future.